Frank-Walter Steinmeier (German: [ˈfʁaŋkˌvaltɐ ˈʃtaɪ̯nˌmaɪ̯.ɐ]; born 5 January 1956) is a German politician serving as President of Germany since 19 March 2017. He previously was Minister for Foreign Affairs from 2005 to 2009 and again from 2013 to 2017, and Vice-Chancellor of Germany from 2007 to 2009. He was chairman-in-office of the Organization for Security and Co-operation in Europe (OSCE) in 2016. Steinmeier is a member of the Social Democratic Party of Germany (SPD), holds a doctorate in law and was formerly a career civil servant. He was a close aide of Gerhard Schröder when Schröder was Prime Minister of Lower Saxony during most of the 1990s, and served as Schröder's chief of staff from 1996. When Schröder became Chancellor of Germany in 1998, Steinmeier was appointed Under-Secretary of State in the German Chancellery with the responsibility for the intelligence services. From 1999 to 2005 he served as Chief of Staff of the Chancellery. Following the 2005 federal election, Steinmeier became Foreign Minister in the first grand coalition government of Angela Merkel, and from 2007 he additionally held the office of vice chancellor. In 2008, he briefly served as acting chairman of his party. He was the SPD's candidate for chancellor in the 2009 federal election, but his party lost the election and he left the federal cabinet to become leader of the opposition. Following the 2013 federal election he again became Minister for Foreign Affairs in Merkel's second grand coalition. In November 2016 he was announced as the candidate of the governing coalition consisting of his own party and the CDU/CSU for President of Germany, and thus became the presumptive elect as the coalition held a large majority in the Federal Convention; he left the cabinet on 27 January 2017. He was elected as President by the Federal Convention on 12 February 2017, winning 74 percent of the vote. Steinmeier belongs to the right wing of the SPD, known as reformists and moderates. As chief of staff he was a principal architect of Agenda 2010, the Schröder government's controversial reforms of the welfare state. His lenient policies towards countries such as Russia and China have earned him criticism both in Germany and internationally, and he has been criticized for prioritizing German business interests over human rights. Steinmeier was born in Detmold, West Germany. Although his full name is Frank-Walter, to those who know him well, he goes simply by the name Frank. His father, a carpenter, was affiliated with the Church of Lippe (one of Germany's few Calvinist regional church bodies, and a member church of the Evangelical Church of Germany). His mother, born in Breslau (now Wrocław, Poland), came as a refugee from a Lutheran part of Silesia during the flight and expulsion of Germans after World War II. Following his Abitur, he served his military service from 1974 until 1976, and then studied Law and Political Science at the Justus Liebig University Giessen, where Brigitte Zypries was a fellow student. In 1982, he passed his first exam, and 1986, he passed his second state examination in Law. He worked as a scientific assistant to the professor of Public Law and Political Science at Giessen University, until he obtained his doctorate of Law in 1991. His dissertation explored the role of the state in the prevention of homelessness. Steinmeier is married and has one daughter. On 24 August 2010, he successfully donated a kidney to his wife, Elke Büdenbender. In 2015, Steinmeier served as best man at the wedding of Rüdiger Grube and Cornelia Poletto in Hamburg. He enjoys jazz, and is an avid football fan. He is a Reformed Protestant and an active member of the Reformed Bethlehem congregation in Berlin-Neukölln. Frank-Walter was baptized into his father's church (the Church of Lippe) as a youth. Steinmeier became an Adviser in 1991 for Law of Communication media and media guidelines in the State Chancellery of Lower Saxony in Hanover. In 1993, he became Director of the Personal Office for the Prime Minister of Lower Saxony, Gerhard Schröder. In 1996, he became the Undersecretary of State and Director of the State Chancellery of Lower Saxony. Steinmeier was appointed in November 1998 as undersecretary of state at the office of the chancellor following Schröder's election victory. He replaced Bodo Hombach as the head of the office of the chancellor in 1999. During this period Steinmeier was also one of the advisors to Schröder. He was crucial in securing a red-green majority in parliament for Schröder's contentious "Agenda 2010" of economic reforms. Because of his effective management beyond the spotlight of politics, he was nicknamed Die Graue Effizienz (The Grey Efficiency) —a pun on Graue Eminenz, the German for éminence grise. In 2004, Steinmeier participated in diplomatic negotiations settling on compensation payments with Libya for victims of the 1986 terrorist bombing of the LaBelle disco in Berlin. Upon taking office, Steinmeier led the preparations for Germany taking over the rotating presidency of the Council of the European Union in the first half of 2007. During his time in office, Steinmeier was widely regarded as having good working relations with Angela Merkel but often taking a different stance on foreign affairs. By and large, he allowed Merkel to set the pace in foreign policy., working harmoniously with her on a range of foreign policy issues, from confronting Iran over its nuclear program to negotiating binding goals to combat climate change. In one significant foreign-policy disagreement, Steinmeier held in 2009 that Germany should by 2013 lay the groundwork for withdrawing its troops from Afghanistan, a deployment that around two-thirds of Germans opposed by then. Unlike Merkel, he also favored Turkish entry into the European Union. Also, Steinmeier became known for his rather Russia-friendly stance, arguing strenuously for engagement with the increasingly assertive power to the east, rather than its isolation. He formulated a policy toward Russia deliberately reminiscent of "Ostpolitik", the eastward-facing policy pioneered by Chancellor Willy Brandt in the early 1970s. Together with Gernot Erler, the SPD's leading Russia expert and the deputy foreign minister, Steinmeier initiated Germany's so-called Partnership for Modernization with Russia (announced in 2008), which became an official EU policy in 2010. Pressed by lawmakers to say more on his attitude toward Russia in the wake of the high-profile murders of opposition figures Anna Politkovskaya and Alexander Litvinenko at a 2007 hearing at the European Parliament, Steinmeier stated that "[t]here is a certain trend toward [media] hysterics and one needs to get a sense of reason back into the debate". In May 2008, he became the first foreign official to hold talks with President Dmitri Medvedev and Prime Minister Vladimir Putin after they took up their new positions following the 2008 presidential elections. In 2006, Foreign Affairs published an analysis of the state of US and Russian nuclear forces, concluding that post-Cold War US nuclear forces seemed designed to carry out a preemptive strike against Russia or China and that the planned missile defense would be valuable primarily in an offensive context as an adjunct to a US first-strike capability. The article elicited a semi-official Russian response from ex-PM Yegor Gaidar in the Financial Times a few days later. In 2007, the US government reportedly was reportedly deeply irritated, although publicly silent, about Steinmeier, who had sounded supportive of Russian accusations that a planned US missile defense complex in Poland would upset the strategic balance in Europe – and who then left without challenge Russian General Nikolai Solovtsov's threat of retaliation against Poland and the Czech Republic if they deployed U.S. defensive systems. Russian opposition activists later celebrated when Steinmeier and the SDP lost the 2009 election, signaling their discontent with Steinmeier. Oleg Petrovich Orlov, head of the Memorial human rights group, said that Steinmeier had prolonged Schröder's policies on Russia and that Germany's policies were "extremely bad for civil society, democracy and the country as a whole". Steinmeier served as acting chairman of the SPD from 7 September 2008 to 18 October 2008. Domestically, throughout his term he was the only major politician with approval ratings consistently as high as or higher than Merkel's. This was helped by the especially high ratings foreign ministers generally receive in Germany. After the SPD's decisive defeat in the elections – the party's worst performance since World War II by then – Steinmeier, who had been elected to represent Brandenburg an der Havel – Potsdam-Mittelmark I – Havelland III – Teltow-Fläming I, was elected Peter Struck's successor as chairman of the SPD's parliamentary group in the Bundestag, and as such leader of the opposition. After a hospitalization for donating a kidney to his wife in August 2010, Steinmeier returned to his office in October 2010. During his time as leader of the parliamentary opposition, Steinmeier regularly accused Angela Merkel's government of increasing the national debt and pandering to the rich. In 2011, Steinmeier argued that Merkel's decision to appoint her economics adviser, Jens Weidmann, to be the next head of Bundesbank undermined the political independence and public trust in the German central bank. After the elections of 2013 and the new grand coalition government, Steinmeier was appointed foreign minister for a second time in December 2013. He replaced Guido Westerwelle, who had signed the P5+1 accord with Iran in November 2013. His deputies are Michael Roth (SPD) and Maria Böhmer (CDU). Upon taking office, Steinmeier initiated an ambitious review of Germany's foreign policy, holding meetings nationwide and drawing in more than 12,000 people who work at the ministry or abroad. Over the course of 2014, Steinmeier alternated with Merkel as Germany's most popular politician in polls of eligible voters. In light of criticism from the United States, Steinmeier has stood firm on Germany's approach in the Ukraine conflict, where it was balancing support for European economic sanctions on Russia with leaving the door open to a revived partnership. In May 2014, he proposed a greater mediation role for the OSCE, including the convening of local "round table" talks in Ukraine to defuse conflicts. Between 2015 and 2016, Steinmeier hosted a series of Normandy format meetings in Berlin to negotiate a solution of the situation in the East of Ukraine. During the Minsk II talks on a ceasefire for eastern Ukraine in early 2015, he successfully negotiated with Russian President Vladimir Putin on allowing German doctors to visit Ukrainian military pilot Nadiya Savchenko, who had been on hunger strike for more than two months in a Russian jail. Steinmeier has in the past repeatedly ruled out arms shipments to resolve the yearlong conflict. In 2015, Steinmeier hosted a meeting of the delegations from Libya's two rival governments, who were battling for control of the country, and United Nations Special Representative Bernardino León to discuss a UN-sponsored peace and power-sharing proposal despite splits among some of the parties. Steinmeier later was instrumental in convening the International Syria Support Group (ISSG) and the Syria peace talks in Vienna in October 2015, drawing together Saudi Arabia; its main regional rival, Iran; as well as Russia, the United States and other Western powers and regional actors including Turkey and Iraq. President Joachim Gauck announced in June 2016 that he would not run for re-election, resulting in a search for a candidate to succeed him. On November 2016, Chancellor Angela Merkel's conservatives agreed with the Social Democrats to support Steinmeier's candidacy for President in the presidential election, scheduled for 12 February 2017. Merkel had originally wanted to nominate Green politician Marianne Birthler, and as the CDU/CSU and the Greens control a majority in the Federal Convention, Birthler's election would have been secured. However, Birthler after some time decided not to run. On 12 February 2017 Germany's 16th Federal Convention elected Steinmeier President on the first ballot, with 931 votes out of a total of 1,260. Steinmeier took office as President of Germany on 19 March 2017, after the expiration of his predecessor's term in office, and he took on 22 March 2017 the oath that, in accordance with the Basic Law, newly invested Presidents must take before a joint session of the Bundestag and the Bundesrat. Following the Federal Election in September 2017, coalition talks began between the Christian Democratic Union, Christian Social Union, Free Democratic Party and the Green Party. The talks continued for 4 weeks until just past midnight on 20 November when the Free Democrats and their leader Christian Lindner walked out of the talks and they subsequently collapsed. The collapse of the talks left another Grand Coalition as the only coalition with a majority in the Bundestag; this however seemed difficult, as the Leader of the Social Democratic Party Martin Schulz had ruled out another Grand Coalition on multiple occasions. In the following weeks, Steinmeier played an important role in the formation of the next government. This is because if the Bundestag fails to elect a Chancellor in 14 days of voting, the President can either appoint the individual with most votes to lead a minority government or dissolve the Bundestag and call new elections. This type of political crisis had never been seen in Germany before and pushed the President into a quite powerful position which is rare for Germany. Steinmeier declared, he would not consider a dissolution of the Bundestag as a preferable solution, and managed to persuade Schulz, to meet with Angela Merkel and start preliminary talks. After long coalition talks, CDU, CSU and SPD formed a new grand coalition. Merkel was re-elected in the Bundestag on 14 March 2018. In the past, Human Rights Watch has labeled Steinmeier as "Realpolitik advocate", for whom, "when it comes to defining his relationship with countries such as Russia and China, human rights play only a subordinate role". In Steinmeier's opinion, the "[r]ejection of capital punishment is one of the keystones of German human-rights policy. The death penalty goes against our fundamental ethic and moral principles". He personally called for the abolition of the death penalty in Uzbekistan; capital punishment in Uzbekistan has been abolished since 2008. In April 2014, he summoned the Egyptian ambassador Mohamed Higazy after a Cairo court sentenced 683 individuals to death for inciting violence during protests in summer 2013, following the military overthrow of elected President Mohammed Morsi. Following the 2016 Turkish coup d'état attempt, he warned that any move by Turkey to reinstate the death penalty would derail its efforts to join the European Union. In August 2016, Steinmeier labelled U.S. Republican presidential candidate Donald Trump a "hate preacher". In a joint article in the Financial Times on 14 December 2010, Steinmeier and Peer Steinbrück proposed to solve the European debt crisis with "a combination of a haircut for debt holders, debt guarantees for stable countries and the limited introduction of European-wide bonds in the medium term, accompanied by more aligned fiscal policies". In February 2011, Steinmeier proposed Steinbrück as a candidate to lead the European Central Bank. Under Steinmeier's parliamentary leadership, the Social Democrats raised pressure on Chancellor Angela Merkel to agree to more burden-sharing to stem the euro zone crisis, repeatedly calling on her to assume greater risks to avert a breakup of the single currency. In both February and November 2012, his parliamentary group voted largely in favour of the Merkel government's proposal for eurozone bailout packages for Greece, while criticizing the measures as being "not an enduring solution for the Greeks". In July 2014, he helped build the opposition's support for a euro zone rescue package for Spanish banks. Later, as foreign minister, he publicly advised against "frivolous" talk of a Greek withdrawal from the eurozone, calling for a serious search for a solution. Reacting to a growth of euro-skeptic political parties across Europe by early 2014, Steinmeier offered the United Kingdom limited support on renegotiating the Treaties of the European Union, saying Germany wanted to see Britain's influence in the "midst" of the EU, not on "the sidelines". After Britain's vote to leave the EU in 2016, he argued that the union lacked the cohesion to undertake major new integration steps and should instead focus on migration, high youth unemployment and security. At the same time, Steinmeier worked to develop new formats and revive new ones. In December 2014, he met with the foreign ministers from the three Nordic countries Denmark, Finland and Sweden – Margot Wallström, Erkki Tuomioja and Martin Lidegaard – for the so-called "N3 + 1" format to discuss issues of common concern for the first time. In August 2016, he joined French foreign minister Jean-Marc Ayrault in pledging to "reinvigorate" the Weimar Triangle and published a document 'A strong Europe in a world of uncertainties'. Between 2014 and 2016, he visited the three Baltic states – Estonia, Latvia and Lithuania – six times, the highest number of visits by any German Foreign Minister. Also in late 2014, Steinmeier and his British counterpart Philip Hammond united in a bid to end a deadlock in relations between Bosnia and the European Union, arguing that the EU should abandon its insistence on changes to Bosnia's electoral code as a precondition for a Stabilization and Association Agreement on the path to EU membership. On 14 May 2014, Steinmeier became the first German foreign minister to attend a meeting of the French cabinet. Together with his French counterpart Laurent Fabius, he flew on several joint diplomatic missions between 2014 and 2015, including to Moldova, Georgia, Tunisia, Nigeria and Bangladesh. In 2016, he joined Fabius' successor Jean-Marc Ayrault for trips to Ukraine, Libya, Mali and Niger. In May 2007, the daily Financial Times Deutschland reported that Steinmeier had served as mediator in the so-called Bronze Night controversy, an Estonia-Russia dispute over the removal of a Red Army memorial in Tallinn. According to the report, Steinmeier suggested the Estonian ambassador to Russia, Marina Kaljurand, go on vacation in an effort to calm the situation. Steinmeier called his Russian counterpart Sergei Lavrov to suggest not only that Kaljurand take a holiday, but also that Russia drop the dispute for the time being. After speaking with Lavrov, Steinmeier reportedly called Estonian Foreign Minister Urmas Paet and got him to agree to the deal. Kaljurand left Moscow for a two-week vacation and pro-Kremlin youth activists blockading the Estonian embassy in Moscow ended their protests the same day. 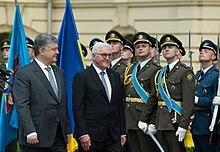 Upon returning to government in late 2013, Steinmeier criticized Russia in his inaugural speech for exploiting Ukraine's economic plight to prevent it from signing the Ukraine–European Union Association Agreement. In March 2014, he defended Russia's membership of the G8, saying "The format of the G8 is actually the only one in which we in the West can speak directly with Russia." When Germany held the chairmanship of the group in 2015, he maintained that excluding Russia over its actions in Ukraine was a necessary step but not a goal in itself; citing the Middle East, he argued that "a look at the world shows that we need Russia as a constructive partner in a number of conflicts". In a 2015 letter to Cecilia Malmström, the EU's trade chief, Steinmeier proposed a joint declaration between the EU and Russia offering Moscow the prospect of long-sought investment and energy concessions to create a more integrated economic area from the Atlantic to the Pacific. According to the letter, "by the content of this declaration we could respond to Russia's wishes and begin a closer exchange of views on energy and investment protection issues, even if the Ukraine–European Union Association Agreement does not directly touch on them". In June 2016, Steinmeier criticised NATO 'warmongering' on Russia: "The one thing we shouldn't do now is inflame the situation with loud sabre-rattling and warmongering." The CDU politicians Volker Bouffier and Herbert Reul criticised him for his stance on Russia, but his comments were welcomed by the Russian media. Steinmeier voiced his support for Barack Obama when Obama was still a presidential candidate, and supported Obama's wish to deliver a speech before the iconic Brandenburg Gate during the 2008 U.S. presidential campaign. In 2016 Steinmeier described then-U.S. presidential candidate Donald Trump as a "hate preacher". After Trump's election, Steinmeier refused to congratulate him, and condemned Trump's views. He has been described as "the German government's most strident detractor" of Trump. During a 2006 meeting with Turkmen President Saparmurat Niyazov, Steinmeier criticized Turkmenistan for its slow progress in implementing the rule of law and human rights and said that the state's progress in carrying out political reforms had been "too halting". In August 2006, Steinmeier made his first visit to Afghanistan, where Germany had taken over the command of the 21,000-strong NATO-led International Security Assistance Force (ISAF) shortly before. Ahead of the 2009 federal elections, Steinmeier – then still in his capacity as foreign minister – commissioned an internal report on Germany's engagement in Afghanistan which recommended that Germany should start pulling out of the country within four years; at the time, this was seen as a stark departure from Steinmeier's earlier insistence Germany should not set a date for withdrawing its then 4,200-strong contingent from the north of Afghanistan as the move could play into the hands of Taliban insurgents. In October 2014, Steinmeier visited both Armenia and Azerbaijan to facilitate a negotiated solution to the long-standing conflict over Nagorny Karabakh, a region of Azerbaijan controlled by ethnic Armenians. In 2016, he returned to both countries to in his capacity as chairman of the Organization for Security and Co-operation in Europe (OSCE) to reinvigorate the talks. In the Israeli–Palestinian conflict, Steinmeier supports a two-state solution and calls for an end to the Israeli occupation of the Palestinian territories. He welcomed the United Nations Security Council Resolution 2334 and said the Israeli settlements on occupied territory is an obstacle to peace and a two-state solution. He further said that "a democratic Israel is only achievable through a two-state-solution". Steinmeier praised the speech by US Secretary of State John Kerry which outlined the United States' position on the Israeli–Palestinian conflict in December 2016; in the speech Kerry said a peace agreement must be based on the 1967 lines, that all citizens must enjoy equal rights, that occupation must end, that the Palestinian refugee issue must be resolved, and that Jerusalem must be the capital of both states, and criticised the Netanyahu government's agenda as driven by "extreme elements". Steinmeier is a staunch proponent of the Iran nuclear deal framework, and has called the agreement "an opening for further diplomatic endeavors". Steinmeier has visited the Zaatari refugee camp in Jordan twice to learn more about the plight of Syrians fleeing the violence in the ongoing Syrian civil war that erupted in 2011, first in his capacity as chairman of the SPD parliamentary group in May 2013 and later as foreign minister in May 2015. In early 2014, upon taking office as foreign minister, he agreed with Chancellor Angela Merkel and Defence Minister Ursula von der Leyen that Germany would help destroy Syria's arsenal of chemical weapons materials as part of an international disarmament program. In October 2014, he co-chaired the Berlin Conference on the Syrian Refugee Situation along with Development Minister Gerd Müller and the UN High Commissioner for Refugees, António Guterres. In March 2015, Steinmeier said he "can understand" Saudi Arabia's decision to mount a military intervention in Yemen and acknowledged the operation had "support from the region". However, he said the crisis could not be solved by violence and urged a negotiated solution. Steinmeier has made the African continent the destination of many foreign trips. On his first visit as Germany's foreign minister in 2006, his tour to Libya, Algeria, Tunisia, Morocco and Mauritania was aimed at preparing Germany for its presidency of the EU and the G8 the following year. In August 2007, he travelled to Nigeria and Ghana. In February 2008, he made a three-day visit to Ghana (on the occasion of the 2008 Africa Cup of Nations), Togo and Burkina Faso. Over the course of 2014, Steinmeier visited Ethiopia, Tanzania and Angola; Nigeria and Tunisia (with his French counterpart Laurent Fabius); and South Africa (for the 8th South Africa-Germany Bi-National Commission). In 2015, he made official trips to Morocco, Tunisia and Algeria; to the Democratic Republic of the Congo, Rwanda and Kenya; Egypt; and Mozambique, Zambia and Uganda. Since becoming a member of the German Bundestag, Steinmeier has voted in favor of German participation in United Nations peacekeeping missions as well as in United Nations-mandated European Union peacekeeping missions on the African continent, such as in Somalia (2009, 2010, 2011, 2014 and 2015), Darfur/Sudan (2010, 2011, 2012, 2013, 2014, 2015 and 2016), South Sudan (2011, 2013, 2014, 2015 and 2016), Mali (2013 and 2014), the Central African Republic (2014), and Liberia (2015). In 2012 and 2013, however, he voted against German participation in Operation Atalanta in Somalia. Steinmeier has rejected claims for war reparations from the Greek Syriza party in response to Germany's position on the Greek government-debt crisis. When incoming Greek Prime Minister Alexis Tsipras, in his first major speech to parliament in early 2015, pledged to seek war reparations from Germany, Steinmeier replied to Greek Foreign Minister Nikos Kotzias that Germany was fully aware of its political and moral responsibility for the "terrible events" in Greece between 1941 and 1944 when German troops occupied the country. "Still, we are firmly convinced that all reparations issues, including forced loans, are judicially settled once-and-for-all," Steinmeier said. Steinmeier openly attacked Merkel over her 2007 meeting with the Dalai Lama, accusing the chancellor of "playing to public opinion" without regard for the effectiveness of the meeting in improving political or religious rights on the ground in China. In 2008, he refused to meet the Dalai Lama during his five-day visit, arguing that such a meeting could undermine international efforts to promote sustained contact between China and Tibet. Instead, Steinmeier issued the statement "it takes a lot of courage not to meet with the Dalai Lama these days", which the New York Times described as "extraordinarily cynical" and accused Steinmeier of prioritizing business interests over human rights. In the case of Murat Kurnaz, innocently imprisoned in 2002 and tortured by the US, Steinmeier allegedly had an offer by the United States Department of Defense and the CIA already in September 2002 regarding a transfer of Murat Kurnaz to Germany, where he was born and raised. Kurnaz had been first sold as a terror suspect in Pakistan, then imprisoned in Afghanistan and later in Guantanamo Bay Naval Base, Cuba, until 2006. By refusing the offer Steinmeier is thought to have been politically directly responsible for his continued imprisonment. During a 2015 debate about Germany's recognition of the Armenian Genocide on the occasion of its centenary, Steinmeier was the politician most reluctant to endorse it, mainly because of Germany's relations with Turkey. He was widely criticized for his position and accused of Armenian Genocide denial. When the German Bundestag almost unanimously approved a resolution in 2016 that recognises the killings of up to 1.5 million Armenians by Ottoman forces as a genocide, a description that Turkey strongly rejects, Steinmeier abstained from the vote and criticized the resolution in public; Steinmeier was one of only two of the 630 members of parliament who did not support the resolution. And Steinmeier alleged that calling Armenian massacres genocide risks belittling the Holocaust, which drew sharp rejection from German journalist Henryk Broder. 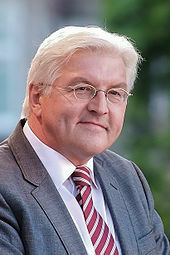 Following the 2013 elections, Steinmeier became the first prominent member of the Social Democrats to be confronted with allegations that he plagiarized parts of his 1991 doctoral dissertation about the role of the state in the prevention of homelessness. Similar accusations had previously led to the resignation of two ministers of the Merkel government. In response, Steinmeier rejected the charges and said that he had asked the University of Giessen to check his dissertation for unacknowledged citations. In May 2013, a university committee for safeguarding academic practices found that Steinmeier had no fraudulent intent and had not committed academic misconduct in his dissertation. The committee did find "technical weaknesses" in Steinmeier's citations, but said they were not severe enough to consider revoking his degree. ^ Gabriel takes reins at German Foreign Ministry Deutsche Welle, 27 January 2017. ^ Steinmeier to run for German leader Al Jazeera, 18 October 2008. ^ a b "Union attackiert "Putin-Versteher" Steinmeier". t-online.de (in German). 20 June 2016. ^ a b "Steinmeier's bad example". The New York Times. 20 May 2008. ^ Judy Dempsey (17 October 2005), "A promotion to cabinet for Schröder's top aide". New York Times. ^ Alex Grimm (10 February 2009). "To be perfectly Frank... minister shortens name". Reuters. ^ "Das Ehepaar Steinmeier über das ökumenische Zusammenleben". Dom Radio. ^ Markus Feldenkirchen (24 September 2009). "From Pen-Pusher to Chancellor Candidate: Frank-Walter Steinmeier's Reluctant Path into the Spotlight". Der Spiegel. ^ a b c d Melissa Eddy (30 September 2013). "German Politician Faces Plagiarism Accusations". New York Times. ^ "Opposition Leader Steinmeier to Donate Kidney to His Wife". 'SPIEGEL ONLINE, Germany'. 23 August 2010. Retrieved 13 February 2017. ^ Delhaes, Daniel (1 July 2015). "Steinmeier wird Trauzeuge: Die Trauringe, bitte!" [Steinmeier becomes Best Man: The Wedding Rings, please!]. Handelsblatt.com (in German). ^ a b c Noah Barkin (23 September 2009), "Factbox - German SPD candidate Frank-Walter Steinmeier", Reuters. ^ a b c Bernstein, Richard (23 November 2005). "Merkel Takes Office in Germany and Announces Coalition Cabinet". The New York Times. Retrieved 7 July 2013. ^ a b c Schrödermeier: A foreign minister under pressure to account for the past The Economist, January 19, 2006. ^ Judy Dempsey (May 17, 2007), Letter From Europe: In German town, a foreign minister paves way for future International Herald Tribune. ^ Richard Bernstein and Michael R. Gordon (2 March 2006), Berlin File Says Germany's Spies Aided U.S. in Iraq New York Times. ^ Charles Hawley (20 October 2005), Letter from Berlin: Taming the Lions with Angela Merkel Bloomberg. ^ Judy Dempsey (17 May 2007), Letter From Europe: In German town, a foreign minister paves way for future New York Times. ^ Andreas Cremer and Brian Parkin, "Muentefering, Vice-Chancellor Under Merkel, Quits", Bloomberg, 13 November 2007. ^ a b Markus Walker (14 September 2009), "German Challenger Gains an Edge", Wall Street Journal. ^ a b Nicholas Kulish (5 September 2008), Without Primaries or Caucuses, Campaign for German Chancellor Begins The New York Times. ^ Mark Landler (22 May 2007), Putin Prompts Split in German Coalition, The New York Times. ^ Jakob Mischke and Andreas Umland (March 20, 2014), Germany abandons its 'soft' approach to Russia Le Monde diplomatique. ^ Andrew Rettman (23 January 2007), Steinmeier sketches new EU policy on Central Asia EUobserver. ^ Judy Dempsey (15 May 2008), Russia: German Foreign Minister Visits, The New York Times. ^ Keir A. Lieber and Daryl G. Press (March/April, 2006), The Rise of U.S. Nuclear Primacy Foreign Affairs. ^ Yegor Gaidar (28 March 2006), "Nuclear punditry can be a dangerous game", Financial Times. ^ John Vinocur. (27 February 2007), Silenced by Self-Inflicted Impotence International Herald Tribune. ^ "German Vote Raises Hopes in Russia". Moscow Times. 29 September 2009. ^ "German Foreign Minister to Meet Clinton: Steinmeier Calls For 'New Trans-Atlantic Agenda'", Spiegel Online, 3 February 2009. ^ Geir Moulson (18 December 2005), German Foreign Minister Confirms Hostage in Iraq Is Free Washington Post. ^ German hostages freed in Iraq Al Jazeera, 2 May 2006. ^ "Iran releases German fisherman", Al Jazeera, 13 March 2007. ^ Germany's parties and politicians, Al Jazeera, 27 September 2009. ^ "Merkel's rival concedes defeat in German election". The Telegraph. 27 September 2009. ^ Patrick Donahue (15 December 2013), Merkel's Third-Term Cabinet: Social Democratic Party Ministers International Herald Tribune. ^ "Steinmeier wird Oppositionsführer". Die Zeit (in German). 27 September 2009. ^ Judy Dempsey (16 November 2009), Social Democrats in Germany Strive to Rebound From Election Pummeling International Herald Tribune. ^ Judy Dempsey (16 February 2011), Merkel Names an Adviser to Lead the Central Bank New York Times. ^ Melissa Eddy (28 September 2012), Merkel's Ex-Finance Minister to Oppose Her New York Times. ^ Alison Smale (19 November 2014), Germany's Foreign Minister, a Man in the Middle – Frank-Walter Steinmeier Meets With Vladimir Putin, The New York Times. ^ Birgit Jennen (18 June 2014), Merkel Running for Fourth Term Seen Possible by Ally De Maiziere Bloomberg News. ^ Patrick Donahue (12 March 2015), Germany Blasts Republicans in U.S. on Iran Nuclear Talks Bloomberg News. ^ Ukraine: Germany calls for second Geneva conference Deutsche Welle, 4 May 2014. ^ Alison Smale (September 13, 2015), Guarded Optimism as Cease-Fire Holds in East Ukraine New York Times. ^ Patrick Donahue (11 March 2015), Merkel's Top Diplomat to Rebuff U.S. Call to Arm Ukraine Bloomberg News. ^ EU leaders push Libya rivals over peace deal The Daily Star, 11 June 2015. ^ Alison Smale (3 December 2015), Germany Rebukes Its Own Intelligence Agency for Criticizing Saudi Policy New York Times. ^ Andreas Rinke and Andrea Shalal (14 November 2016), Steinmeier to swap German foreign ministry for presidency Reuters. ^ "Marianne Birthler gab Angela Merkel wohl einen Korb". Tagesspiegel. ^ "Blow for Merkel as German talks collapse". BBC News. 2017-11-20. Retrieved 2017-11-20. ^ Noack, Rick (2017-11-20). "Analysis | Angela Merkel has few options left to govern Germany". Washington Post. ISSN 0190-8286. Retrieved 2017-11-20. ^ GmbH, Frankfurter Allgemeine Zeitung (2017-11-20). "Mögliche Szenarien: Kommen jetzt Neuwahlen?". FAZ.NET. Retrieved 2017-11-20. ^ Wenzel Michalski (10 February 2014), A Second Chance for German Foreign Minister Steinmeier Human Rights Watch. ^ Federal Minister Steinmeier on the World Day against the Death Penalty Federal Foreign Office, press release of 9 October 2009. ^ Speech by Foreign Minister Frank-Walter Steinmeier to the German Bundestag on the 60th anniversary of the Universal Declaration of Human Rights Consulate General of the Federal Republic of Germany in Dubai, 5 December 2008. ^ Robert Hutton (3 February 2014), Steinmeier summons Egyptian ambassador after mass death sentence Deutsche Welle, 29 April 2014. ^ Tom Körkemeier (18 July 2016), German formin: Death penalty would prevent Turkish EU membership Reuters. ^ Dave Graham (14 June 2009), Germany summons Iranian ambassador over election Reuters. ^ "German foreign minister: Donald Trump is a 'hate preacher'". Politico. 5 August 2016. ^ Christian Reiermann and Klaus Wiegrefe (16 July 2012), Chancellor Schröder's Legacy: Germany's Leading Role in Weakening the Euro Der Spiegel. ^ Rainer Buergin (9 August 2012), German SPD Demands Merkel Backs More Crisis Burden-Sharing Bloomberg Businessweek. ^ Greece bailout: German MPs give strong backing BBC News, 27 February 2012. ^ German parliament approves Greek bailout fund Al Jazeera, 30 November 2012. ^ Gareth Jones and Stephen Brown (30 November 2012), German lawmakers approve Greek bailout despite qualms Reuters. ^ Charles Hawley (30 November 2012), Squabbling in the Bundestag: German Parliament Rubber Stamps Aid for Greece Spiegel Online. ^ Annika Breidthardt and Michelle Martin (20 July 2012), Merkel wins Spanish aid vote with big majority Reuters. ^ Michelle Martin (14 April 2015), Mogherini says Europe must show flexibility on Greece Reuters. ^ Robert Hutton (3 February 2014), Germany Offers U.K. Limited Support on EU Treaty Negotiation Bloomberg. ^ Andrea Shalal (13 September 2016), Germany's Steinmeier against new integration push by EU Reuters. ^ Mu Xuequan (2 December 2014), FMs from Germany, three Nordic countries meet first time in "N3 + 1" format Archived 2014-12-17 at the Wayback Machine Xinhua News Agency. ^ "A strong Europe in a world of uncertainties". French Ministry of Foreign Affairs. 28 June 2016. ^ Richard Milne (12 March 2014), Crimea occupation casts shadow of 1940 over Baltic nations Financial Times. ^ Anton Troianovski (17 April 2015), Germany Seeks to Counter Russian 'Propaganda' in Baltics Wall Street Journal. ^ Andrew Gardner (6 November 2014), UK, Germany bid to change EU's Bosnia policy European Voice. ^ Alison Smale (15 October 2014), French Minister Attends German Cabinet Session The New York Times. ^ Margarita Antidze (24 April 2014), France, Germany show EU support for Georgia as Ukraine crisis mounts Reuters. ^ France and Germany back Libya unity cabinet BBC News, 16 April 2016. ^ German and French foreign ministers pledge support for Mali Deutsche Welle, 2 May 2016. ^ Conor Gaffey (4 May 2016), Niger Needs $1 Billion From Europe to Tackle Migration: Minister Newsweek. ^ Steinmeier to Discuss EU-Russia Tensions on Baltic Tour Deutsche Welle, 10 July 2007. ^ Alexandra Hudson (17 December 2013), New German minister criticizes Russia over Ukraine Reuters. ^ Thorsten Severin (2 March 2014), German foreign minister against excluding Russia from G8, Reuters. ^ Andreas Rinke (4 June 2015), German minister says G7 should welcome back Russia longer term Reuters. ^ Alex Barker, Stefan Wagstyl and Roman Olearchyk (1 December 2015), Germany pushes EU-Russia deal to avert Ukraine trade pact tension Financial Times. ^ "German foreign minister accuses Nato of 'warmongering' with military exercises that could worsen tensions with Russia". The Independent. 18 June 2016. ^ "Warum der Kreml Steinmeier feiert" [Why the Kremlin is celebrating Steinmeier]. Bild (in German). 20 June 2016. ^ Schmiese, Wulf (12 July 2008). "Obama und das Brandenburger Tor: Jetzt hat auch Steinmeier einen Dalai Lama". FAZ.NET. ^ Bannas, Günter (8 November 2016). "Der unbekannte Trump: Berlins Sorge vor dem "Hassprediger"". FAZ.NET. ^ "German Foreign Minister Steinmeier warns of 'hate preacher' Trump". Deutsche Welle. 4 August 2016. ^ "Germany's likely next president has called Trump a 'hate preacher'". Washington Post. ^ ""Ich will nichts schönreden": Steinmeier gratuliert Trump nicht". Nachrichtenfernsehen TV. ^ Wehner, Markus (14 November 2016). "Deutsche Politiker zu Trump: Falsch!". FAZ.NET. ^ "Coalition backs 'anti-Trump' to be new German president". The Local. 14 November 2016. ^ Margarita Antidze (April 24, 2014), Steinmeier Criticizes Central Asia's Forgotten Dictatorship, Deutsche Welle, November 2, 2006. ^ Abkhazia rejects peace plan Al Jazeera, July 18, 2008. ^ Steinmeier Calls for International Probe Into Georgia Conflict Deutsche Welle, September 5, 2008. ^ Margarita Antidze (April 24, 2014), France, Germany show EU support for Georgia as Ukraine crisis mounts Reuters. ^ Steinmeier Reasserts Germany's Pledge to Afghanistan Deutsche Welle, August 21, 2006. ^ Bertrand Benoit (September 13, 2009), Steinmeier shifts stance on troop pullout Financial Times. ^ Armenia warns Azeris over helicopter shooting Al Jazeera, November 12, 2014. ^ Chase Winter (June 29, 2016), Germany's top diplomat seeks solutions in Armenia-Azerbaijan conflict Deutsche Welle. ^ "Steinmeier begrüßt UN-Resolution gegen Siedlungsbau". ^ "In strong attack on Israel, German foreign minister says settlements jeopardize peace". ^ "Steinmeier verteidigt US-Außenminister Kerry". ^ (www.dw.com), Deutsche Welle. "Germany's Steinmeier: Nuclear deal 'opening' for Mideast diplomacy - News - DW.COM - 17.10.2015". ^ Dagmar Engel (May 16, 2015), German foreign minister in Jordan refugee camp Archived 2015-12-08 at the Wayback Machine Deutsche Welle. ^ Germany will help dispose of Syrian chemical weapons Reuters, January 9, 2014. ^ Supporting stability in the region: Syrian Refugee Conference in Berlin Federal Foreign Office, Berlin. ^ "Germany 'understands' Saudis' military action in Yemen". The Journal of Turkish Weekly. 28 March 2015. Archived from the original on 7 April 2015. ^ Steinmeier Clinches Debt Repayment Deal on North Africa Tour Deutsche Welle, November 16, 2006. ^ Libya talks raise hopes in HIV case Al Jazeera, June 11, 2007. ^ Fred Attewill (December 11, 2007), Zimbabwe's 'Nazi' slur on chancellor rankles Berlin The Guardian. ^ Michael Nienaber (February 10, 2015), Greek Foreign Minister Takes War Reparations Claim to Berlin, Gets Rebuffed New York Times. ^ Berlin lehnte Kurnaz-Freilassung ab, Deutschlandfunk 23. January 2007 (German). ^ "Murat Kurnaz: "Fünf Jahre meines Lebens" - Report on Kurnaz and his imprisonment in Guantánamo on the occasion of the release of his book (German)". stern.de. 20 April 2007. ^ "An Innocent Man, Tortured by the U.S., Asks the U.N.: Where's the Accountability?". The Intercept. ^ Katharina Schuler: „Fall Kurnaz: Kälte, Hunger, Schläge", Die Zeit Nr. 4/2007, 19. January 2007. ^ "Steinmeier fürchtet wegen Armenien-Beschluss um Beziehungen zu Türkei". ^ a b Henryk M. Broder (25 April 2015). "Völkermord: Herr Steinmeier, Sie haben von nichts eine Ahnung!". DIE WELT. ^ "Steinmeier und der Völkermord an den Armeniern". tagesspiegel.de. ^ Tulay Karadeniz and Noah Barkin (May 31, 2016), Erdogan warns Germany ahead of Armenian genocide vote Reuters. ^ a b "German university rejects plagiarism allegations against Steinmeier". DW.com. Bonn, Germany. May 11, 2013. ^ "Jury". Wirtschaftliche Gesellschaft (in German). Retrieved 2018-07-21. ^ Software, LUAX. "Rudolf Pichlmayr Stiftung". Pichlmayr Stiftung (in German). Retrieved 2018-07-21. ^ "Sigmar Gabriel übernimmt Vorsitz im Kuratorium von „Aktion Deutschland Hilft"". Aktion Deutschland Hilft (in German). Retrieved 2018-07-21. ^ "D-Frankreich-Diplomatie: Steinmeier weiht neue Kathedralenfenster in Reims ein - WELT". DIE WELT. 2015-11-05. Retrieved 2017-05-25. ^ "German Foreign Minister Steinmeier to Receive Honorary Doctorate from Hebrew University of Jerusalem | האוניברסיטה העברית בירושלים | The Hebrew University of Jerusalem". new.huji.ac.il. 2015-11-05. Retrieved 2017-05-25. ^ "Foreign Minister Kotzias to meet with German Foreign Minister Frank-Walter Steinmeier (Athens, 29 October 2015) - Meetings - Events". www.mfa.gr. 2015-10-27. Retrieved 2017-05-25. ^ "Universität Paderborn ernennt Steinmeier zum Ehrendoktor - WELT". DIE WELT. 2016-12-19. Retrieved 2017-05-25. ^ Von Georg, Leppert (2017-01-10). "Bubis-Preis: Frankfurt ehrt Steinmeier". Frankfurter Rundschau (in German). Retrieved 2017-05-25. ^ "Deutsche Rekordhilfen für WFP 2016 sichern Millionen Syrern das Überleben und investieren in eine Welt ohne Hunger". UN World Food Programme (in German). 2017-01-23. Retrieved 2017-05-25.